Enormous queues formed outside The Brighton Centre www.brightoncentre.co.uk waiting to enter this year's VegFest www.brighton.vegfest.co.uk despite the stormy weather conditions. 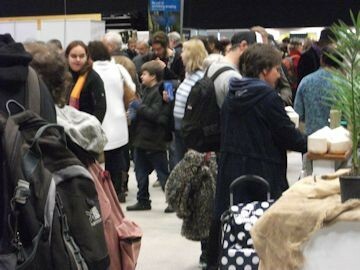 Inside the centre, crowds thronged the walkways at the exhibition. Jimmy Pierce from The Vegan Society www.vegansociety.com told me that they are receiving 500 applications every month from people wanting to take up the "30 Day Vegan Pledge" and that 91% who try out a vegan lifestyle for 30 days, remain vegan. He pointed out it's not just about food. Becoming vegan also means not using products that derive from animals such as leather, wool or fur and not using cosmetics tested on animals. A total of 18,000 products bear The Vegan Society logo. As I am gluten free and Ray is dairy free, we always have to be careful that food meets both criteria. If food is vegan, it doesn't necessarily follow that it is also gluten free, so this is something you have to remember. 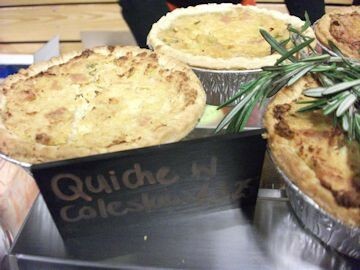 So I was unable to sample the vegan quiche (which means it's also egg free) from V-Bites www.vbitesfoods.com that Ray devoured, savouring every mouthful. "I'm so enjoying this," he said. He's been programmed over the years to ask "Is there dairy in this?" Although he realises if a product is vegan it means it is dairy free, he still had to ask to make sure - as he couldn't believe it. This was definitely the case at the Cocoafeliz stand www.cocoafeliz.com with its array of beautiful vegan and vegetarian chocolate. We enjoyed a white chocolate ganache and a rose fondant in dark chocolate. Bliss. 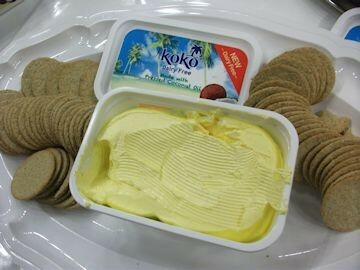 We're fans of the Koko dairy free range of coconut milk www.kokodairyfree.com so was pleased to discover the launch of a new Koko dairy free spread made with pressed coconut oil. 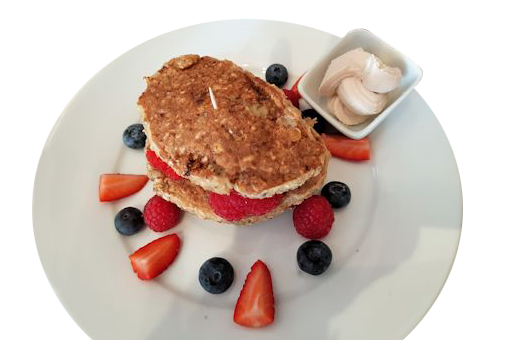 We tasted the spread on gluten free oat cakes - delicious. It will be available from Waitrose www.waitrose.com as well as other supermarkets and healthfood shops later this month. Explore Asian www.explore-asian.com showcased its highly original bean pastas, gluten free and dairy free. Our favourite is Edaname & Mung Bean Fettucine. Other varieties include Black Bean Spaghetti and Edaname Spaghetti. Finding something gluten free for lunch was challenging especially as the Food Village was packed with people. 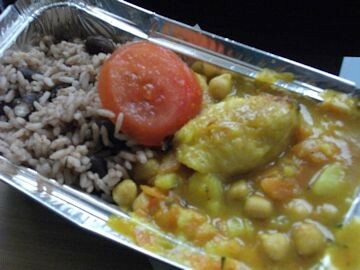 Eventually I sampled a Caribbean-style chickpea and sweet potato curry with roasted tropical pumpkin from St Best Caterers www.stbestcaterers.co.uk - well worth the wait! This was accompanied by a Tropical Twist drink with ginger and tamarind. Alas we arrived too late at the Ms Cupcake www.mscupcake.co.uk stand - they had virtually sold out of vegan cupcakes. On display was a range of giant American vegan cookies (gluten free is available) in different varieties such as Red Velvet and Double Chocolate as well as vegan date slices. Copies of the Ms Cupcake book was also on sale. 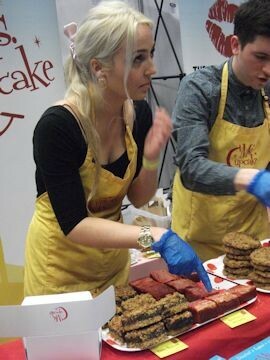 Ms Cupcake is London's first vegan bakery - I will get there one day! 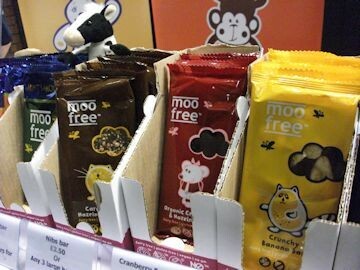 We enjoyed sampling Moo Free dairy free chocolate www.moofreechocolate.com especially the Caramelised Hazelnuts Bar. Talking about chocolate, The Raw Chocolate Company www.therawchocolatecompany.com launched its Raw Chocolate coated mulberries - a delicious combination.